Based on the Alessandro Baricco's novel this is the story of a married silkworm smuggler, Herve Joncour, in 19th Century France who travels to Japan to collect his clandestine cargo. While there he spots a beautiful European woman, the concubine of a local baron, with whom he becomes obsessed. Without speaking the same language, they communicate through letters until war intervenes. Their unrequited love persists however, and Herve's wife Helene begins to suspect. The treacly charms of romance or the misery of longing can be a subjective experience. When it is executed with its heart in the right place, the genre can become a wondrous thing for any viewer, the aching moods and complex emotions it augurs start and continue to change the way we perceive films. Unfortunately for Francois Girard, his lofty follow-up to 1998’s “The Red Violin” doesn’t come close at all. 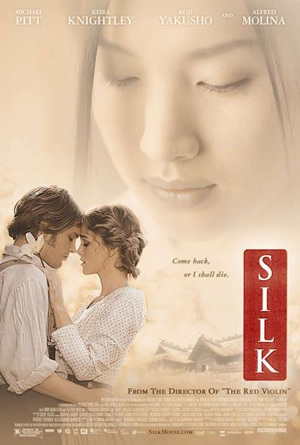 While “Silk” is stunningly beautiful, it is also stunningly dull. Ostensibly the love story beyond borders, the film is overly ripe and more reliant on the sweeping idea of romance to validate its scenes across the tides of its stoic languor and oppressive superficiality. The campy high-culture attempted (and perhaps even perfected at times) by Girard becomes almost a parody once the film makes a conscious decision to put the onus of feeling on the film’s lush cinematography (by cinematographer Alain Dostie, it has to be mentioned) and pervasive score. It becomes meaningless by its end, an unwieldy and unemotional piece that never once approaches what it intends to convey. Based on Italian novelist Alessandro Baricco’s best-selling novel, “Silk,” tells a story of brewing obsession in a 19th century French trader. Joncour (Michael Pitt) seeks an escape from a career in the military and an opportunity to wed his beloved Helene (Keira Knightley) by accepting a textile entrepreneur’s offer of travelling to the “end of the word” – Japan in this case – to acquire uncontaminated silkworm eggs for a considerable fee. Journeying into the unknown, the interior of Japan’s snowy villages, he completes his transaction but encounters complication in his infatuation with a warlord Jubei’s (Koji Yakusho) mysterious concubine (Sei Ashina). Inconsequential is a term that can be shared by both Girard’s soulless translation and his Pitt’s anaemic performance that’s as passive and unengaging as it gets. There’s a suffocating exterior to the film’s condescension to present beauty as a substitute for affected sentiment that interprets into a self-negating interest in its characters. Girard canvasses the usual sentiments and practical conundrums that result from a cross-cultural love affair, with the geography of the land looking sumptuous in a film as frosty as its icy hills. He falls into similarly banal trappings of not recognising the lines between eroticism and exoticism of Asian sensuality and this misplaced fascinated with the Orient is represented in Joncour’s ardent and illicit desire to experience the thrill of the unknown but unwilling to compromise the familiarity of home. The courtly subservience of the concubine’s femininity is the fibre to Girard’s weightless fabric of vain pageantry, becoming as enthralled with the fanciful brocades as Joncour is struck by his lust for the girl wearing them.